First order of business is to find out what the inverter actually does and to see if it is in any way secure. 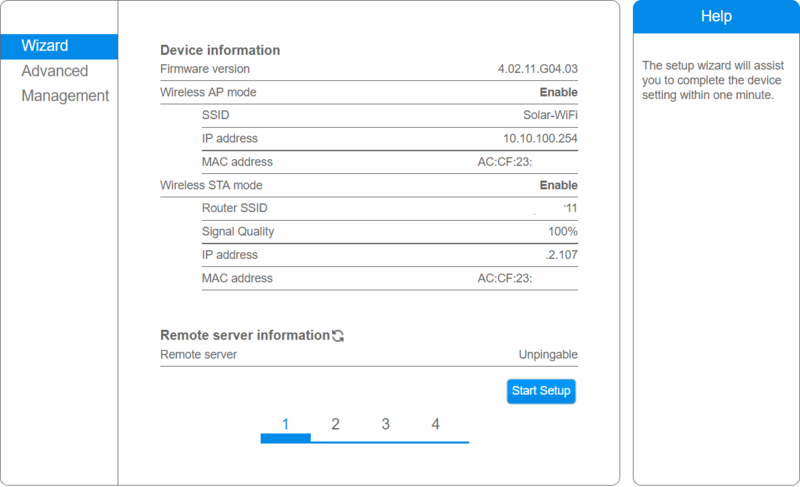 The inverter is connected to my wireless LAN and uses DHCP to get an IP-address. Thus it gets the DNS configuration I push from my FreeBSD home-server. There's an unknown device in my network with a MAC OUI AC:CF:23 which apparently is registered by Hi-Flyin. The IP-address has port 80 open (no other ports) and runs a webserver. It even has a login (realm A11)! So how do I get in?!? Let's just try Username admin and Password admin... Lo' and behold! From the WebUI we can see that this is the Goodwe Inverter, so let's move on! Now that we know the IP-address of the inverter, it's time to find out what the thing is actually doing on the network. My home-server is not acting as the gateway, but it is hosting DNS. Time to fire up pcap to see where it connects to. This tells us they're simply connecting to www.goodwe-power.com. Waiting a bit longer doesn't result in any other addresses it resolves using DNS. local-data: "www.goodwe-power.com. IN A ....2.8"
and reload the configuration, test if this does what it says on the tin. Any traffic from the inverter should now go to my web-server. Again, what are you doing? BINGO! The inverter simply connects to the HTTP port. No security here! I tear down the DNS spoofing temporarily to prepare my web-server for interception. I don't want to loose measurements! Now we go over to the web-server and add a virtual host that simply relays the requests to the Goodwe server. That's the Goodwe server's response, not Apache's, on the correct IP-address and port. Again again, what are you doing? Enabled the DNS spoofing again, and fired up tcpdump. This time I log all output to a file. The output file is then inspected in WireShark. The only thing the inverter is doing is posting content. 0000   b4 99 ba eb fe af ac cf 23 aa bb cc 08 00 45 00   ........#.S)..E.
0010   00 da 12 f0 00 00 40 06 0a 99 01 01 02 6b 01 01   ......@......k..
0050   2f 44 61 74 61 6c 6f 67 20 48 54 54 50 2f 31 2e   /Datalog HTTP/1. In the output, I recognize my inverter's ID as I also see it on the Goodwe website "13600DSU11100041". NOTE: The device ID has been modified, I don't want anyone to pollute my data! The POST body contains binary data, what does it mean!? I decided to collect some more samples to see if I can find out what's what in this binary data. On the new Goodwe portal, I can download measurements using the "Reports" section. I selected all available measurements for my inverter, and downloaded the excel sheet. There's no directly visible relation between these 2 sets of data. From the tcpdump output we see that there are hardly any plain ASCII characters in here either. Let's try to convert some of the values to hex and see where that leads. The simple targets are the ones without decimals, so Pac(W) it must be! Using the dec2hex() function of LibreOffice or Excel makes this an easy task. There doesn't seem to be any relevant data in here, perhaps some checksum? Now that I know what the structure of the data is, I can start writing a parser. This will allow me to push the data straight into PVoutput.org without having to scrape it from the Goodwe website first.